Derek Porter Studio was part of an art/design team charged with developing a guardrail enhancement scheme as part of a bridge replacement for the Broadway Overpass. 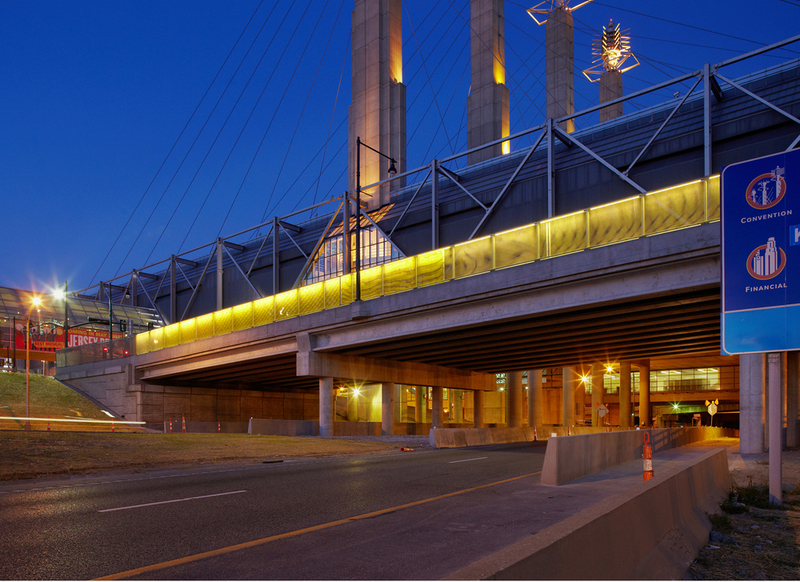 The project is another step toward reconnecting the Downtown Loop with the Crossroads neighborhood and was rebuilt as part of the opening of the Kauffman Center for the Performing Arts. The guardrail enhancement needed to meet strict highway regulatory guidelines (as it passes over a federal interstate) and low maintenance requirements in material construction while offering visual interest to motorists and pedestrians moving within this significant civic and cultural area. The bridge is a primary vehicular artery through the city, and is adjacent to a convention center and new performing art center. Nearby secondary connector roads also link to a civic ballroom, entertainment district, sports arena and downtown businesses. Attention to detail, scale, materiality and color were key considerations that offer a supple and refined physical presence to this otherwise hard and cluttered urban environment. 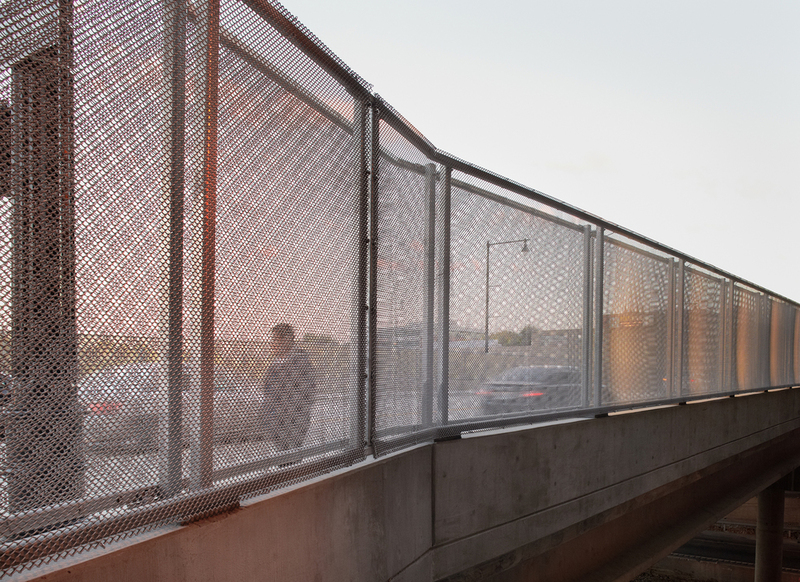 An outer skin of finely patterned chain link mesh is used as a contiguous surface to wrap an internal steel frame situated on top of the barricade wall. Careful alignment, detailing and construction coordination resulted in a clearly defined “edge” condition that renders the bridge as a semi-enclosed theatrical environment. LED lights are located within the resulting 10” deep contained volume along with additional layers of chain link medium of diverse pattern and scale. The lights are positioned in both horizontal and vertical orientations to offer variation in pattern and rhythm to an otherwise monochromatic material palette. The cumulative effect of this layered design yields complex visual moires that move and shift in conjunction with human passage, offering momentary interruption in the urban landscape.